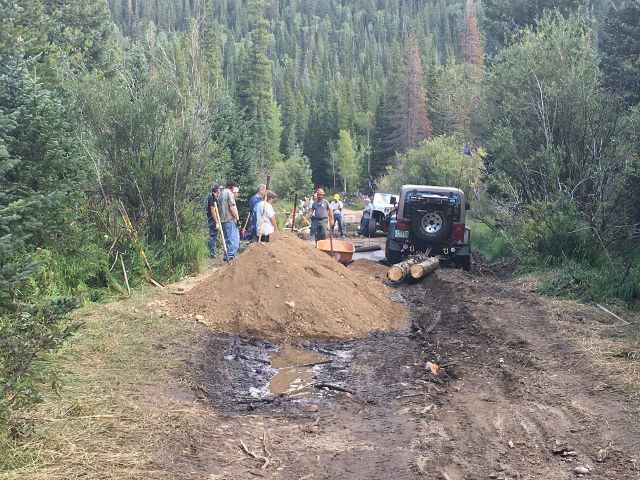 On August 19th, 2017 our club members once again headed to the Middle St. Vrain to repair another mud bog. This one formed just before the two water hole crossings. Gary brought his skid steer to load up the five small trailers we had to haul the road base up to the mud bog. After getting coordinated at the Middle St. Vrain parking lot we headed up the 4WD road with Jared (Boulder Ranger District), and Tim and Zach, the forest service sawyers. Bog before any work was done. The five vehicles hauling the trailers, Gordon, Allen, Oakley, Matt, and Adam, came last after filling them up. 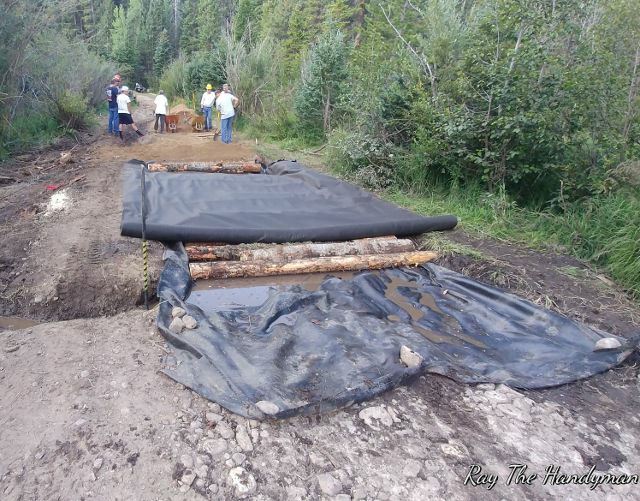 By the time the trailer group drove the 1.4 miles to the bog, the geo-cloth had been placed in the hole. 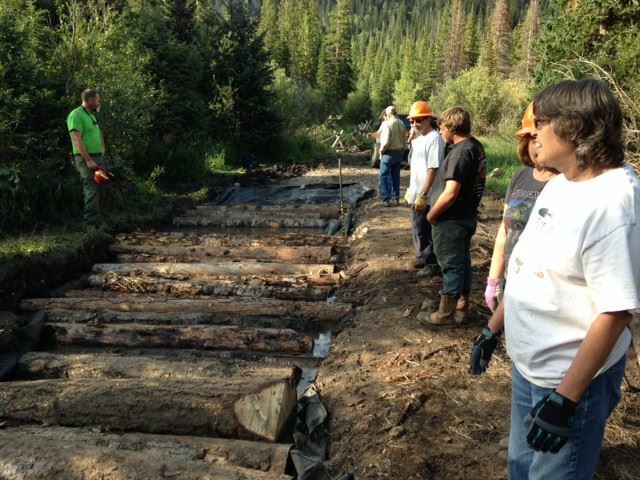 Logs had previously been cut to length from the blow down in the area. These were being drug up to the road to be hauled to the bog to serve as corduroy on top of the geo-cloth. It took an hour to get organized and have the trailers turned around to dump the road base at the head of the hole. We used old chip board to dump the road base on to make it easier to shovel later. After the trailers left, the log group began hauling the logs and placing them in the bog hole. 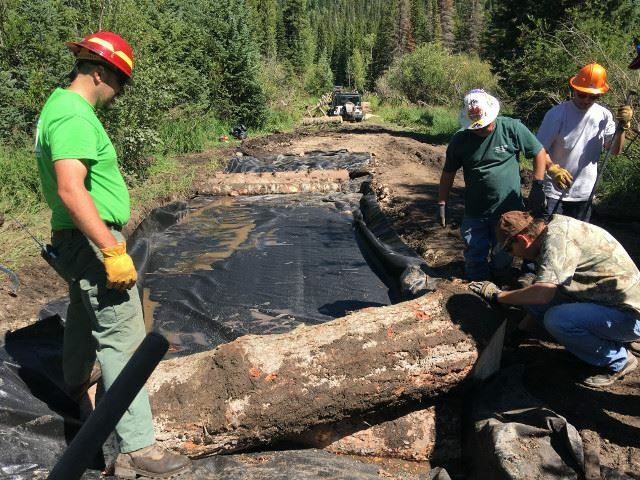 The bog was over 35 feet long and about 10 feet wide. 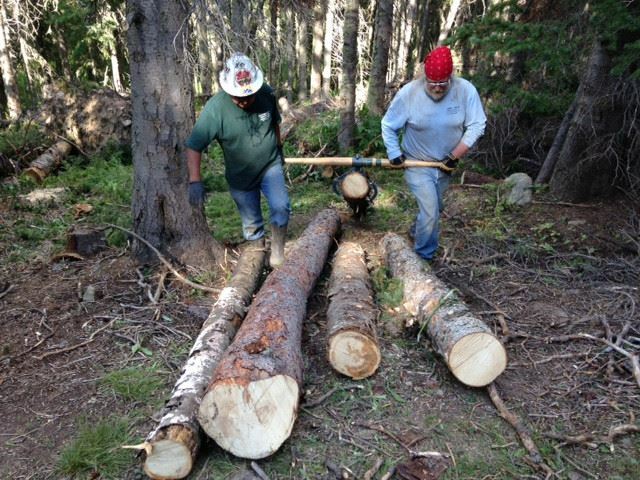 The sawyers were limbing and cutting logs to length to keep up with the need at the hole. In the afternoon only about half of the first course had been laid in. 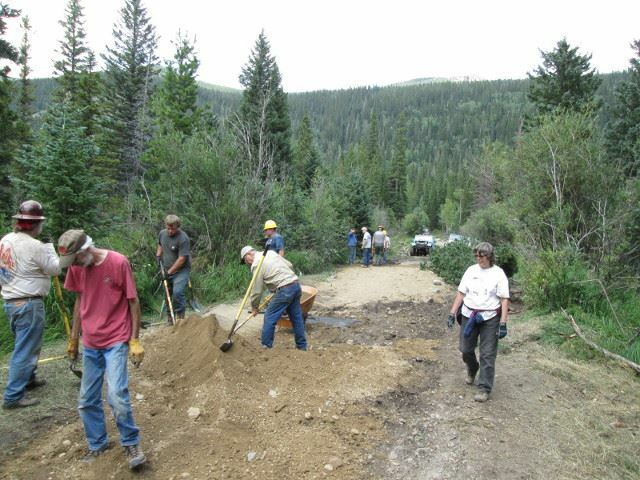 Three trips with the trailers had been made, making a long pile of road base. One more run of all the trailers finished out the hauling of road base for the day, which got most of the road base there, leaving some for later projects. Those that were not spending the night headed out, including the two sawyers from the Forest Service. The gate was locked and those of us that were camping set up just past the two water holes. We had a nice night with a small camp fire to share stories around. Next morning we broke camp after breakfast. Ray arrived early and we all walked over to the bog to review, and plan the day’s work. 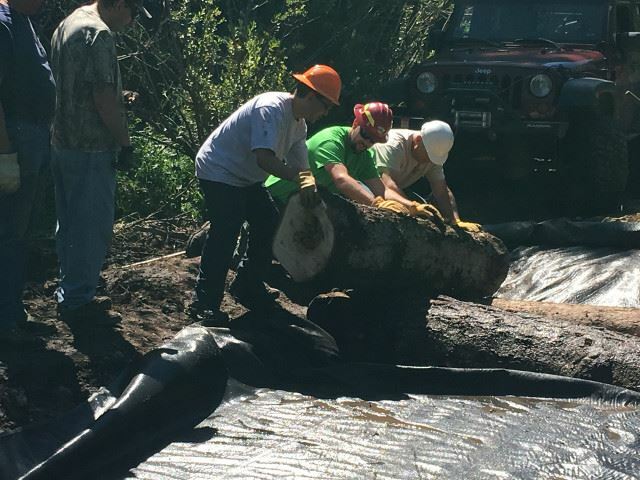 We needed to finish getting the rest of the first course of logs in so that we could start the second course which would allow some to start laying in the road base. 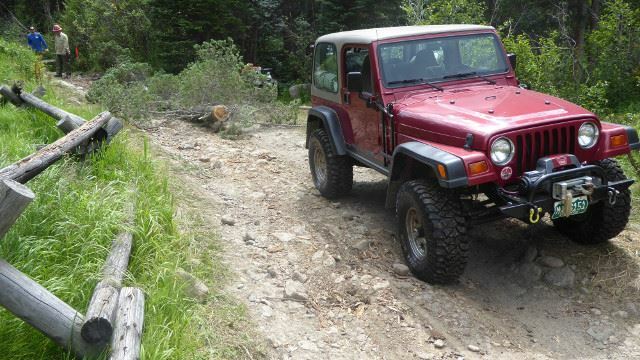 We rounded up Greg’s jeep to winch in the logs, and Gordon’s jeep to fetch the logs from the woods. The Forest Service sawyers arrived and began cutting custom lengths for us. Shortly, we were ready to begin shoveling road base over our corduroy. Finally the road began to look fixed, at least at the start. Matt headed to the entrance to bring back the two wheel barrows the Forest Service sawyers had brought, as well as letting in a few more members to help out. We quickly got into a rhythm and had three to four logs being hauled in by Gordon to be placed in the hole. The shoveling crew would catch up to the end of the logs and get a break as we waited for more logs. 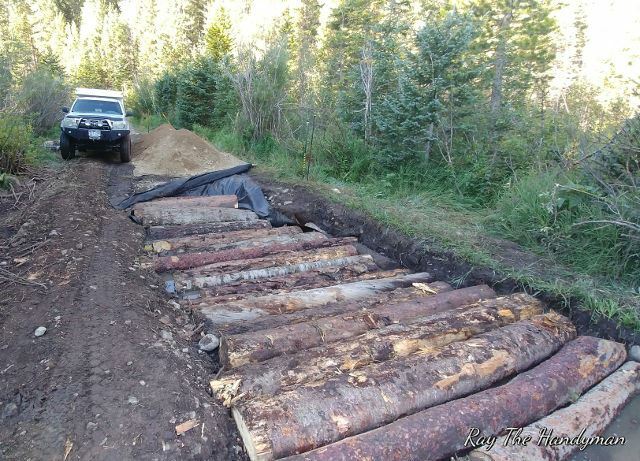 Allen and Oakley took a few trips to the west along the road and collected rocks to augment the logs by filling in some smaller holes. We also placed a few rocks along the ends of the logs to strengthen the sides of the repair. We took a lunch break at noon and then started back up again. As the repair reached the half way point of the 38 foot long bog we were sure we would finish Sunday. The road base we had hauled the day before was going to be enough so another run with the trailers would not be needed. As a last touch a hazard tree was dropped by the sawyers and Gordon dragged the entire thing down to the edge of the repair to keep traffic off of the bypass that had formed. Loading up the tools we headed to the entrance to do a little more work. 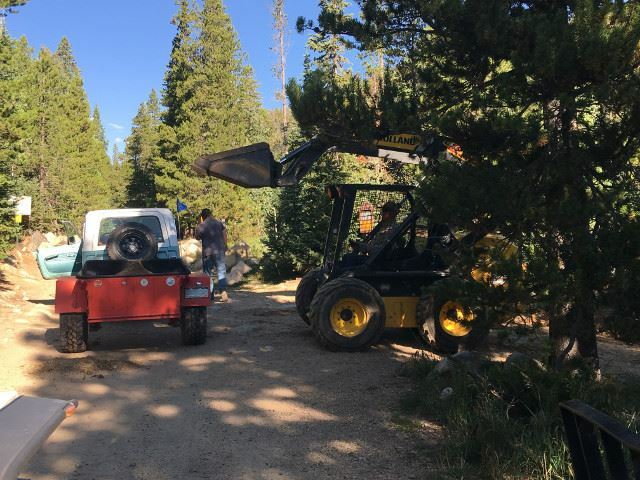 Having five large boulders that we brought in with the road base to use at the obstacle, Greg guided Gary on where to place them to maintain the difficulty of the entrance obstacle. 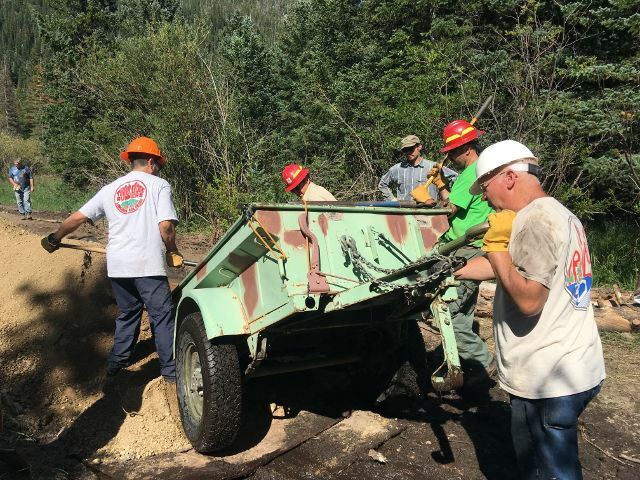 This was done after getting the trailers and the Forest Service Rubicon out. 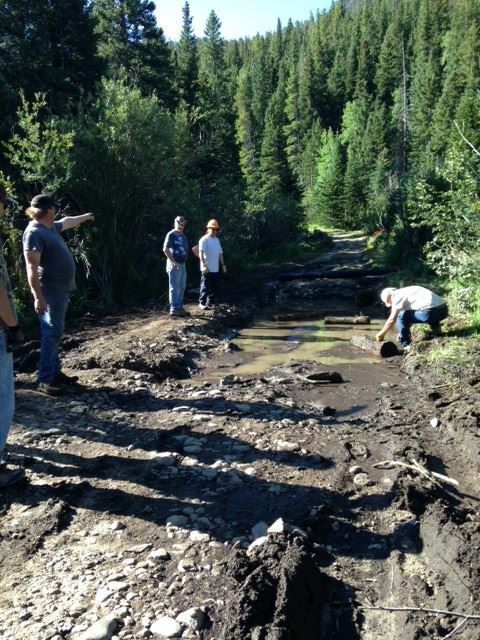 This makes our fifth bog repair on the Middle St. Vrain. Thanks to everyone that helped out on all of the weekends it took to get this done.